Advancing/Improving technology and products and trying new concepts has always been one of the things I enjoyed most about working in the firearms industry and competing in the action shooting sports. There is always room to improve products and make them better. There are many companies in the firearms industry making and selling products staffed by people who do not really shoot or use the products they sell. Consequently, little product advancement is seen from them and the products stagnate and do not improve or move in less logical directions. It is rare for company to have most or all of the staff be serious shooters, whether they be martially oriented, competition oriented, or a mix of the two. The Suarez Group has always stood out to me as being a company that really bucks the status quo when it comes to the products and ideas it promotes. Gabe Suarez himself is focused on advancing the art of small arms technology and techniques, and has staffed his company with serious shooters with a wide range of practical experience. While their focus is on the martial side of shooting, many of the things they are doing appeal to myself as a competitor that prefers to use equipment with practical application and value. The Suarez Group really grabbed my attention in early 2010 when they began advocating the use of the Trijicon RMR on Glock pistols. I had been looking for a practical way to use a red dot on a pistol for several years. The Ironman 3 Gun match I have participated in since 2002 has such a large volume of small targets at longer ranges that must be shot with pistol, it seemed like a natural solution. I had tried various red dot sights on pistols before and found them all lacking. They were too large to use in anything but race style holsters, which are a liability for the types of matches I compete in. Smaller sights were not durable enough. One sight I tried blinked on and off between shots. The mounting systems available were clunky. Even the micro sights available before had less than ideal mounting options. The biggest problem I had using these systems is without any iron sights in line with the dot, the sights could easily be misaligned and I couldn’t see the dot. When I saw the first Trijicon RMR equipped Glocks on The Suarez Group’s Warrior Talk forums in early 2010 I immediately knew it was the solution to the problem I was looking for. The iron sights being in line with the red dot would make the sight alignment a non-issue, the Trijicon RMR was being reported as a very durable sight, in the event it failed the Irons were right there, and the whole package was small enough to fit in a normal duty holster. I sent my Glock 34 slide off to One Source Tactical Technical Services Division and got it back in April of 2010, modified a Safariland holster, and had just enough time to train with the system before going to the Ironman 3 Gun match in June. The RMR equipped Glock helped me get a 3rd place finish in Trooper Division that year. I did indeed find it helpful with regards to accuracy on the numerous small and farther targets, shooting from awkward positions, and making hits while physically stressed. I used the RMR equipped Glock again in 2011 and 2012 making a lot of pistol shots I do not believe I could have done as easily with an Iron sight pistol if at all. With few exceptions the RMR equipped Glock usually allowed me to keep up with competitors using sub-machine guns or pistol caliber carbines. The Suarez Group has expanded their product line since 2010. They are now offering their own complete slide assemblies ready to mount the Trijicon RMR, added several holsters to their product line designed for the RMR equipped pistol, and are now modifying other pistols to accept the RMR. Trijicon has also advanced RMR itself to include new options like adjustable brightness. With the increasing popularity of optics on pistols and The Suarez Group’s continuing expansion of their product line and promotion of new ideas, I wanted to know more about the thought process and philosophy that goes into the way they seek advancements in firearms technology. The Suarez Group’s General Manager, Tom Cornelius, was kind enough to answer my questions below. My questions are in Bold, Tom’s answers are in Italics. What role do you have in deciding what products endorses and sells? My role concerning product selection is focused on: 1. The quality of the item. 2. It’s utility / value to the customer. 3. Formulating a test protocol to evaluate the product under simulated “real world” circumstances. What was your background before coming to The Suarez Group, how has it influenced how you evaluate firearms and equipment? I have served as a Police Officer, Deputy, Corrections Officer, Firearms Trainer, Suarez International Instructor. These experiences have provided me with a focused view of what is needed for an individual to prevail in a fight. 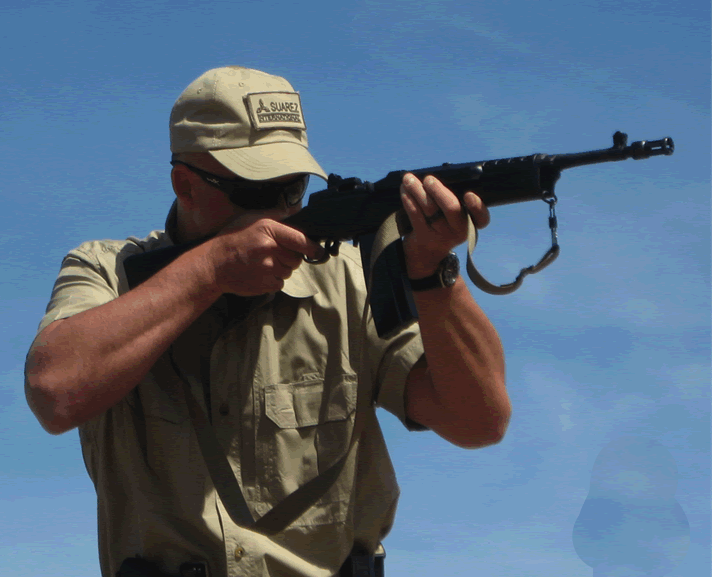 Just as there are trends in the world of fashion, there are trends in the realm of firearms training and equipment. Sometimes these “new” products or techniques have real value and move everyone forward in terms of performance. AND sometimes they are nothing more than a trend. At the Suarez Group, we field test all of our mid & high end products before any customer gets their hands on it. The Suarez Group distinguishes itself from other companies by promoting new technology and platforms others might not consider; Is advancing the art of small arms use and technology part of the philosophy of The Suarez Group? The Suarez Group is absolutely focused on the pursuit of quality and improving performance in the martial realm. Our philosophy is: “Yesterday’s excellence is tomorrow’s mediocrity.” Technology is something we embrace and study with the idea of improving the products we offer. We have noticed many other organizations that cling to techniques or a certain platforms no matter how much data is out there demonstrating the technique or platform is less than optimum for the end user. We do not blindly embrace any equipment or technique without first testing it. Technology in the firearms / training field is just science being applied to a situation. To ignore advancements because of a lack of vision or ignorance is to cheat your students / customers. The TSD Slide Program is an excellent example of this. We spent two years, a considerable amount of capital and around 100,000 rounds of ammunition in a quest to identify the best “recipe” if you will, of how the optic equipped pistol should evolve. This effort required research in to no less than five different fields of expertise to become a finished product. (Metallurgy, Electronics, Ophthalmology, Kinesiology, Physics) Product research and testing at this level is nothing less than navigating through uncharted waters with raw data as your compass. All the driving forces come from technological advancements. Why do you feel this is important? The importance of technology can be something as mundane as a better score for a competitor OR the life saving edge a warfighter needs to prevail in a CQB engagement. The metrics of improved performance are quantified over time. I remember 15-20 years ago when a lot of folks in the firearms training community were ignoring red dot optics and low power scopes for fighting rifles. If a trainer did that today he would be deemed ridiculous by his peers. Those technological improvements in the field of rifle optics have saved untold numbers of lives. How has teaching classes in addition to selling guns/equipment influenced what The Suarez Group views as effective? The Suarez Group has the ability to evaluate gear like no other organization. We have a world wide training cadre that can provide evaluations in not only a varied tactical setting, but extreme environmental conditions too. What methodology of testing does OST/SI use before officially endorsing a piece of equipment or firearm? The methodology concerning testing products varies. Rifles are typically tested by not only in house staff but contractual staff that can put them in play under extreme environmental conditions. ie arctic, jungle, desert, water borne operations. This thoroughness tends to vet weak performers and shows the top performers. High round counts do become part of this protocol too. In a nutshell, we beat the #! !#// out of everything before it is deemed G2GO. This is not cheap. But it has value to our customers & students! What set The Suarez Group on the path of the Red Dot Glock? Well, handguns are the primary tool most people can have with them at all times. It is realistically, the most likely firearm non military individuals will put in to play. While the training & gear industry was attempting to re invent 10,000 different ways to run a pistol class or market a holster, Gabe Suarez began studying handgun performance in gunfights. Not just law enforcement engagements but civilian also. Very few of these gun fights occurred under optimum conditions. To the point, Murphy’s Law was always a factor. Poor lighting, non standard shooting positions, challenging angles, varying distances, etc… etc… Because the pistol has the greatest potential for use, it’s continuing development in terms of combat accuracy under less than perfect conditions is where Gabe chose to align our efforts. An optically equipped pistol that is reliable and has a manageable profile was the answer. I recall seeing a Kelly McCann video many years before The Suarez Group was offering Red Do Glocks where he was using a Doctor optic on a Glock 19; What advances in technology in the past 10 years have made the red dot equipped pistol a more practical option than it was 10-15 years ago? Kelly McCann was a true innovator in terms of experimentation of the concept. The Doctor Optic was an early attempt to produce a compact, rugged optic that is compatible with a fighting pistol. It has been our experience that the Doctor Optic is best suited for light to moderate use at best. With the introduction of the Trijicon RMR Series of Red Dot Sights the concept could finally demonstrate the expanded capabilities of a optic equipped fighting pistol. What makes the Trijicon RMR a better sight for slide mounted use on a pistol than other contemporary options? The RMR Series is very rugged and functions well in a myriad of environmental conditions. Before Trijicon introduced this excellent product, there was nothing to take the concept where it needed to go. We have evaluated and destroyed just about every optic out there that could be put on a pistol. The RMR was the only thing that held up to consistent hard use. The Suarez Group appears to have been very influential in popularizing the red dot equipped pistol over the past several years; why has The Suarez Group succeeded in this where others have not? Our success is based on the pursuit of excellence. Others have attempted to duplicate our efforts but they always fall short. We have seen folks cutting corners on what optics they install, the accuracy of their machining, the compatibility of barrels with their products any many other poorly conceived actions. We focus on quality and the very best materials in our designs. Something a bit sad but becoming a trend, is folks who had slide work done elsewhere approaching us with slides that are messed up and want us to fix the issues from hobbyist machinist’s efforts. Sadly, we cannot help those folks due to liability they created. OST-TSD offers complete factory Glock slides with match grade barrels, how is this a better option than having a factory slide modified? I think of our TSD Slide Packages as a system. The TSD Slide is specifically manufactured for optic use from 17-4 heat treated stainless steel. Our barrels are slightly tighter in fit to offer match grade qualities. They are purposely matched for accuracy & fit. The TSD Barrels are suppressor capable and will function with non jacketed ammunition if desired. There is nothing wrong with having a factory slide milled, it’s just not what that item was originally designed for. OST-TSD is now modifying Sig and S&W M&P slides to accept Trijicon RMRs, What other pistols might be considered in the future? You never know. We have a staff member that does nothing except explore new platforms and their compatibility with the Trijicon RMR. 10-20 years from now do you think optical sights will be as common on pistols as weaponlights are now? I don’t think it will be that long… Great ideas have a way of pushing aside skeptics and cheapskates. What technological advances would you personally like to see in regards to optical sights on handguns? I can’t say… We are working on that as I write this. This entry was posted in Gear, Industry Insiders, Ironman 3 Gun, Red Dot Glock. Bookmark the permalink.